More than a month ago my lovely D got me a big bag of satsumas, as he knows how much I love them. The only problem was, they weren’t satsumas, they were clementines (yes there is a difference! :)). So for the past month those poor clementines were hanging out in the fridge, waiting to be noticed while getting sad looking and soggy. Today, I decided to finally give them the value they deserved! For those who are not familiar with my cooking, I first search for as many good looking recipes as I can, pick up 3 or 4 of the ones with the right ingredients and start the process while mixing and matching the 4 final recipes as I go along. Needless to say, a baking angel dies, and my boyfriend, a believer of the saying “baking is chemistry”, moans painfully every time I go through this routine. After 20 minutes of google search, my final three recipes were clementine cake recipe from Smitten Kitchen, morning sunshine muffins from We Like to Cook and Eat and my darling clementines from Thursday Night Smack down. They were all adaptations from Nigella Lawson’s Clementine Cake and required the clementines to be boiled for 2 hours. 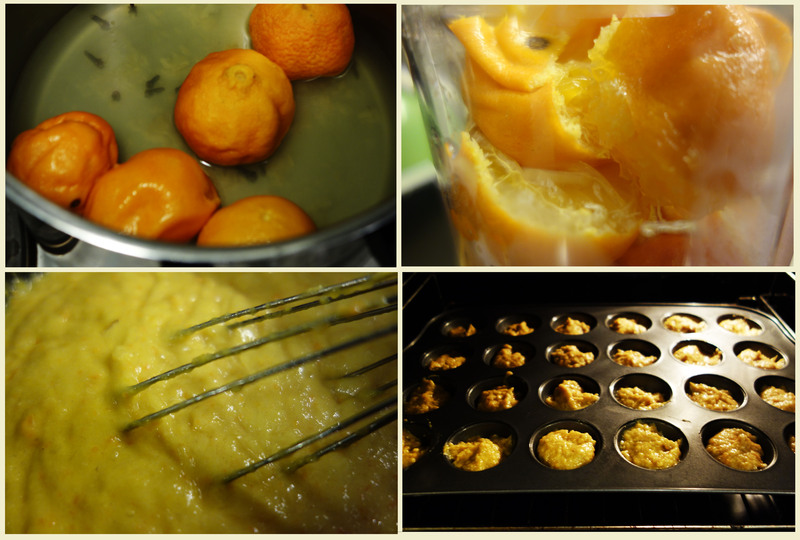 I tossed in the clementines into cold water and decided to boil for an hour as the muffin recipe suggested. While the clementines boiled, I realized I had 2 really old apples in the fridge too, so I started searching if I could add those in the muffins too (by then I had decided to go with the muffins, since I didn’t have any almonds to do the flourless cake). During my search I found out that apple sauce could be used as an egg substitute! Oh la la! So I cubed the two apples and tossed them in with the clementines, while adding some cardamom too. I took out the apples after 15 minutes and mashed them with potato masher and measured them as egg substitutes. I also had a broken egg that I wanted to use, so I also added that after the apple sauce cooled down. After an hour, I took out the clementines, broke them in half to check for seeds, couldn’t find any, and used the mixer to puree them with the peels and all (after they cooled down considerably). I didn’t measure the amount of the puree, since I didn’t have any other place to use clementine puree, I decided not to bother. I was following the muffin recipe and it called for 2 cups (4.6dl) of flour. Being the smart, healthy person I try to be, I decided to cut down the flour and used 2 dl all purpose flour adn 1.5 dl dinkel flour. I also cut down the sugar and added 0.5dl brown (muscovado) sugar and 0.5dl white sugar. And of course the butter (sometimes I wonder why do I even check out the recipes if I never follow them!).. I used 2 tbs butter and 2tbs peanut oil (instead of the 6tbs melted butter). 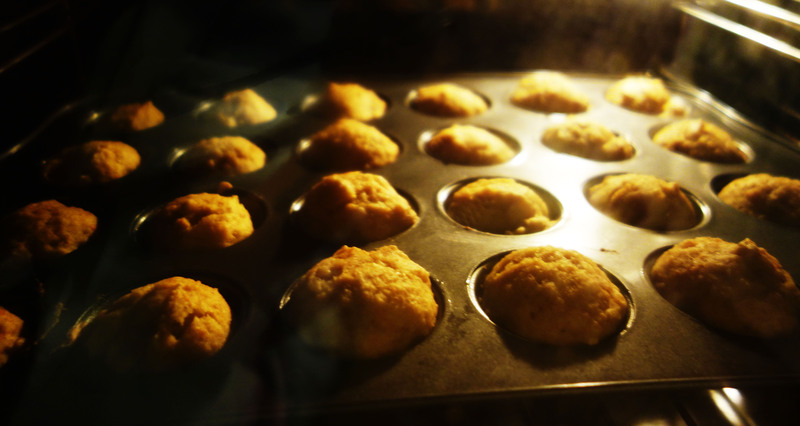 The muffins turned out a bit soggy (as all my muffins tend to.. I’m open for suggestions! ), but nevertheless they taste AMAZING! Boil them in their skins after removing stickers, stems etc and washing, in cold water for 1 hour. Add cardamom on request. After an hour, take out the clementines, drain and let cool. Check for seeds and put all in a mixer/processor with the skins and all to make the puree. Peel and remove the core and cut into medium sized cubes. Toss them in with clementines to take out after 15 minutes. Add all in a bowl and whisk together. Add the wet ingredients to the dry ones and mix together lightly until you are sure all the dry ingredients are moistened. The recipe said “do not over mix” but I am not sure if I managed that!